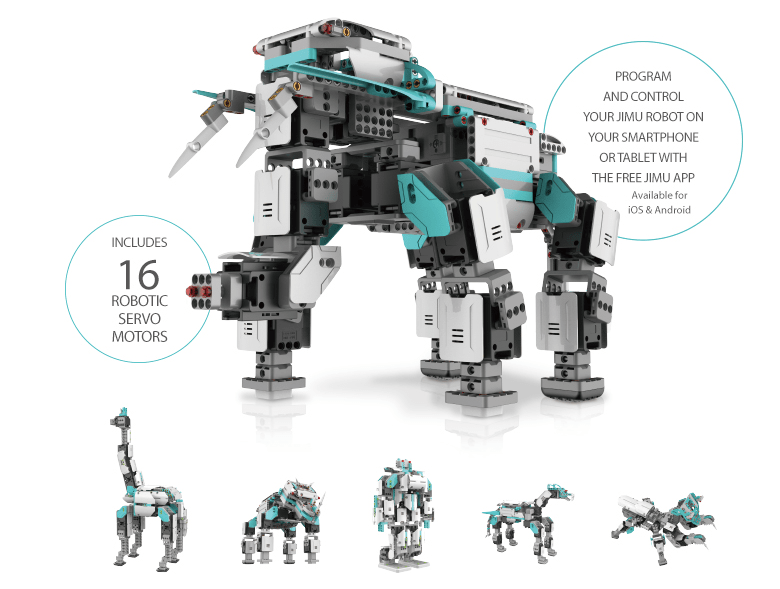 The Robotics JIMU UBTECH Explorer Kit is a package with 7 servo motors, and 372 pieces to design different animals and many others fully programmable robots. As soon as your robot is built, you have to program it, control it and make it work from the application via your Smartphone or tablet. JIMU has many highly innovative features, which many of them (3D modeling of the software, the servo-motor, the PPR program) have been developed and patented especially by UBTECH. Be creative or follow the guide! 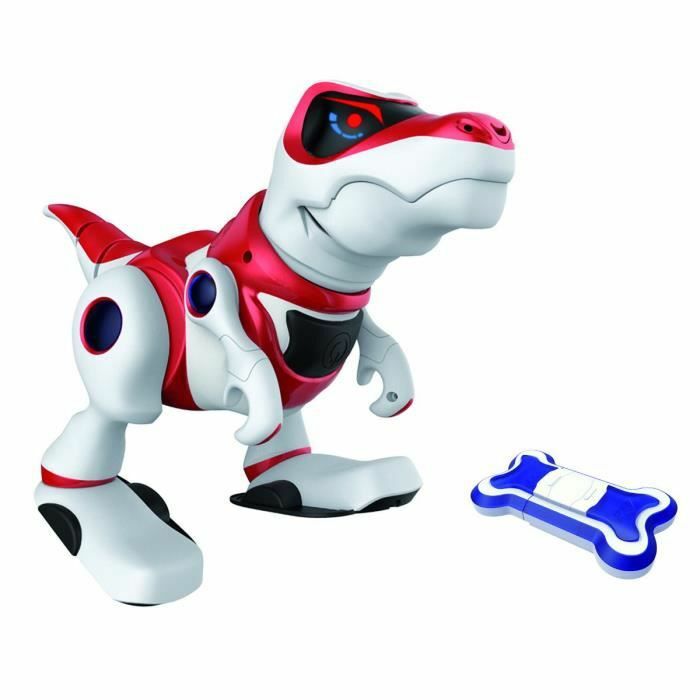 Step 1: Build your robot from your imagiation or with his application which allows inventors to very easily understand the stages of construction 3D! 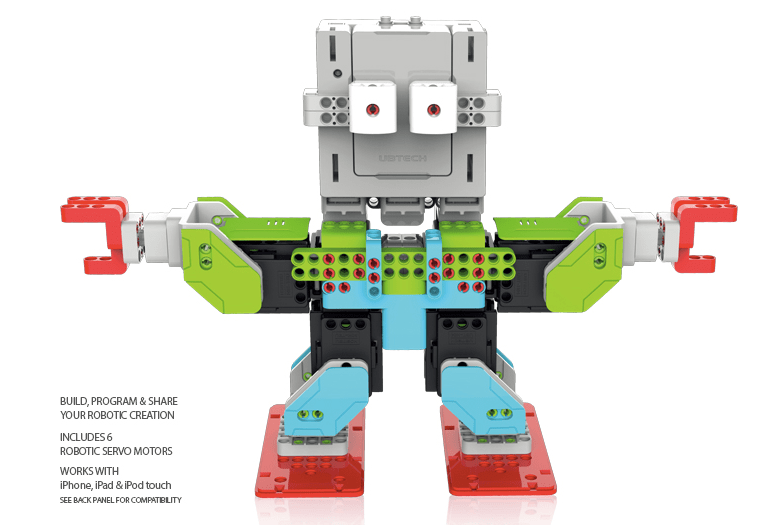 Step by step, you are guided to build your robot from A to Z. Many models are available! Step 2: From the application program the movements that your robot will be on request! Run your imagination because almost all movements are possible! 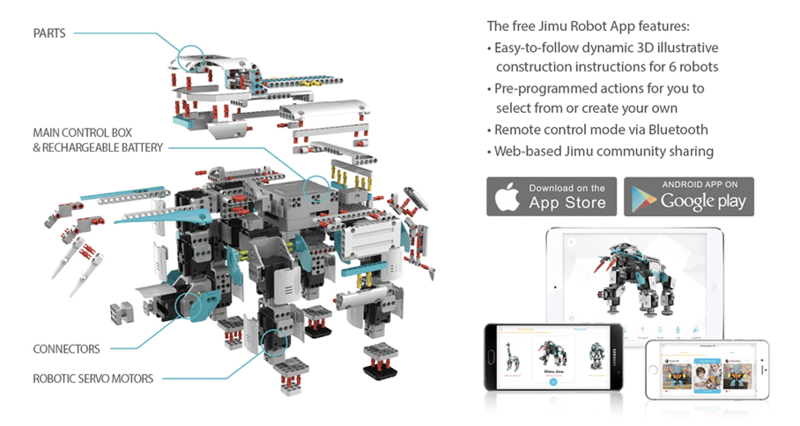 Actuators: Thanks to its 7 servo-engines, JIMU robot has a disconcerting degree of flexibility and maneuverability. Able to complete a large number of different movement! The Contol Box: Real brain of your creations, it transmits all orders scheduled to your robot actuators. 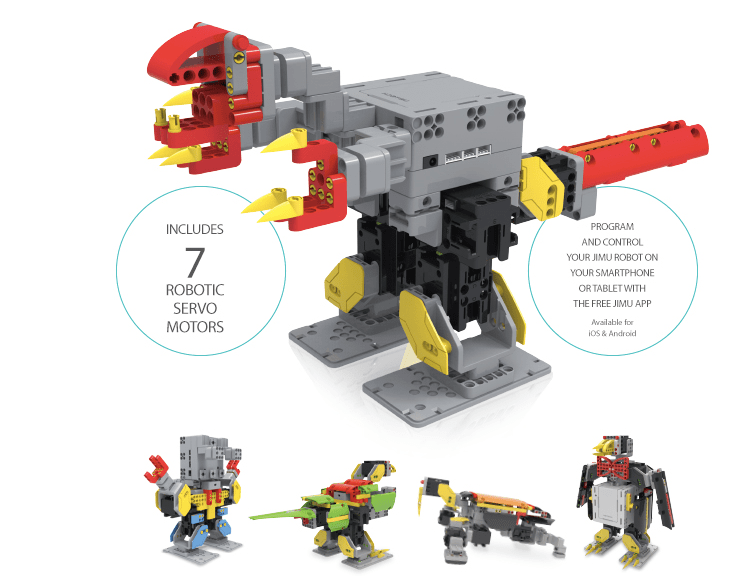 With 372 pieces, you can really have fun! 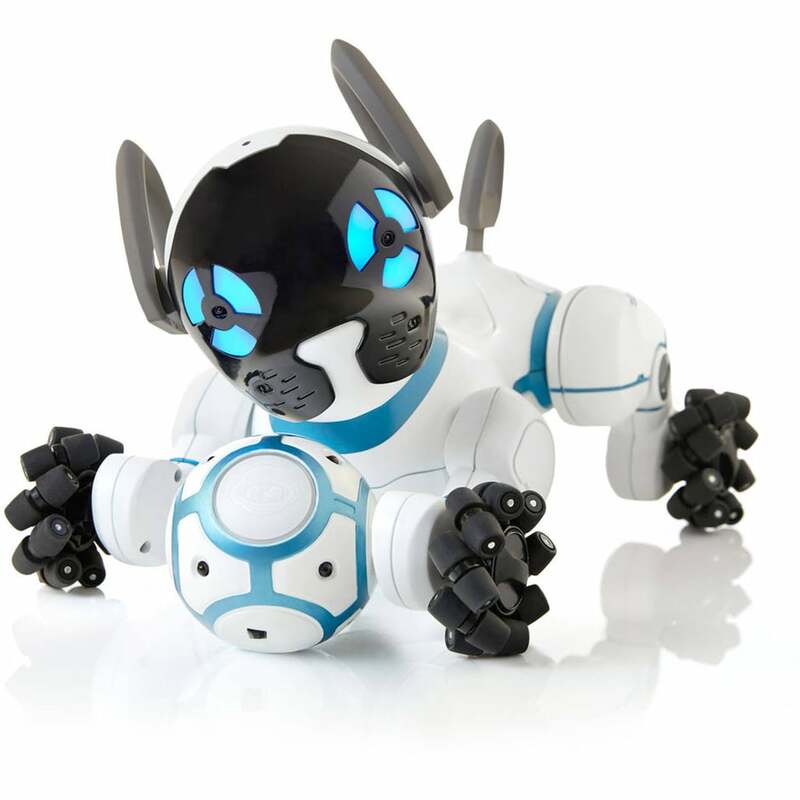 You can either use the help of 3D construction to from your application or create a to Z of the robots or creatures. 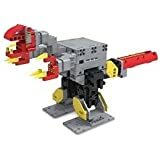 Thanks to the intuitive 3D software choose what are the movements your Robotics creation will realize, then transfer the sequence on the robot and throw it through the application with ease. Then share your creations with other users via the app! An application available on App Store and Google Play.